When someone is lost in time and space, there is a need for something more than just a standard search party. There is no greater expert in tracking than a Two-Nosed Hound. The hounds are intelligent beasts, but they are easily distracted, hard to control, and aggressive. They can be captured and domesticated to a degree, but once they have a master, they will trust no one else. Nocturnal by nature, Two-Nosed Hounds only track at night, and will fight against any urging to do anything in daylight. They are able to find the scent of their targets through dimensions, in the mundane and dream worlds, and even can track people hundreds of years out of time, but their communication of the locations and time are limited to shared telepathic images. Not every species is equipped to withstand the mental strain of telepathic communication, so an untrained master of a Two-Nosed Hound may risk a stroke in trying to understand their hound. Two-Nosed Hounds bounding through dimensional tears. Art by Laura Hamilton. The hounds have two heads, each with a long snout and a very large nose. Their face is shaped similarly to the mundane Bloodhound. They have very long ears. The beasts are covered in a thick, matted fur. Their fur is resistant to fire, acid, and allows them to survive the most extreme cold, but they are vulnerable to parasites and they have a weak immune system, so they are always at high risk of illness. 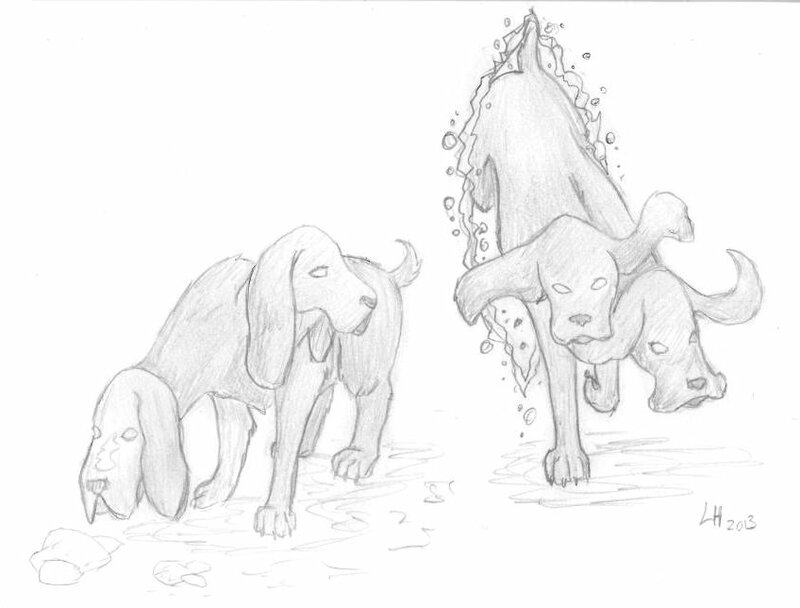 Two-Nosed Hounds have a howl that echoes beyond the mundane world, and their howl risks drawing attention from monsters in the dream world.